Scarlet face with small white spots extending to and becoming larger on the light olive breast. Also light olive on back and wings. Uppertail coverts red, underparts pale yellow, tail rufous. Eyes brown, beak red, legs light brown. Female has less red, greyish underparts. Good beginners bird. Popular aviary bird and breeds well in captivity. Not aggressive to other species and does well in a mixed species collection. Care must be taken to ensure they do not hybridize with other species when housed in a mixed species collection. The Star Finch enjoy Insects, seeds, greens and, especially during breeding season, vitamins, minerals and rearing foods. House indoors at room temperature during autumn and winter. 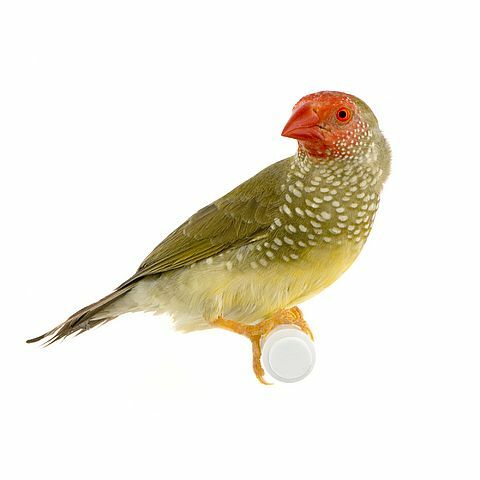 Finches must be able to move around and it is important to their health and well being that they be able to fly from perch to perch. Keep the cage accessories to a minimum to allow free movement. A single toy, mirror, or branch will be plenty and you can change them around periodically to provide variety. Toys that are safe for parakeets are safe for finches. In the wild, some finches love to roll in dew dampened grasses for a bath. You can give your pet a treat by occasionally putting in damp dandelion leaves or grasses in the bottom of the cage for a few hours. An enclosed bird bath put in the cage a couple of times a week will also provide a fun bath for your pet. Just do not let your pet get cold! The Star Finch is peaceful, shy and quiet, good in aviary with other small finches. Spends a lot of time on ground. Male may become aggressive during breeding season. Easy to breed if kept in well-planted (grass, reeds, ivy, dense bushes), quiet aviary. Pair builds its own round grass nest, rather than use a box. Lays 3 to 5 eggs, incubation 13 to 14 days by both parents, fledging 22 to 25 days. Pair may throw young from nest when not satisfied with food.